Pumpkin pie is sweet, and so are your loved ones. 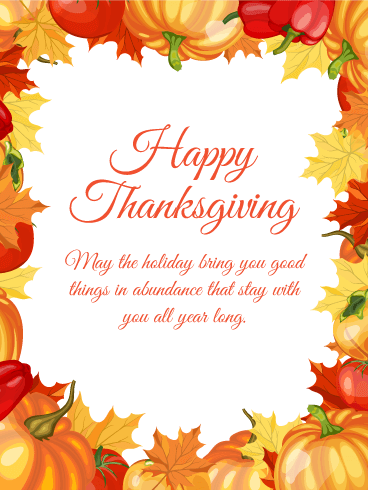 On this holiday when it is traditional to give thanks for all of our blessings, make sure they know how grateful you are for their presence in your life and how much better your life is for it with this festive Thanksgiving card. A yummy slice of traditional pumpkin pie is surrounded by fall foliage on a background in autumn colors making this the perfect card to mark the Thanksgiving holiday. 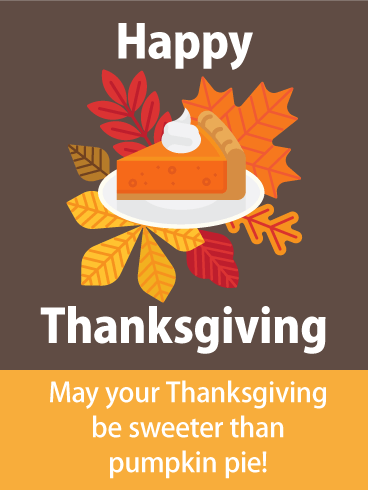 Happy Thanksgiving - May your Thanksgiving be sweeter than pumpkin pie! This thoughtful card sets the perfect tone for Thanksgiving, from the colorful background to the beautiful sentiment. 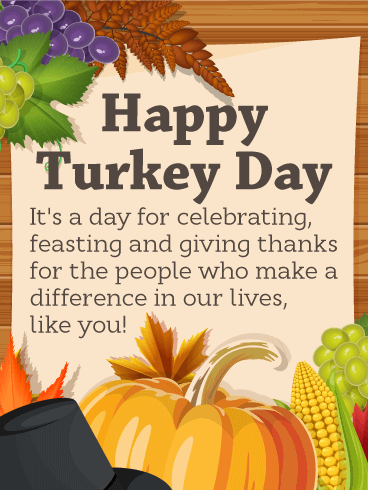 On a day dedicated to giving thanks and counting our blessings, this lovely greeting will let someone special to you know that they make a difference in your life, which will make all the difference in their day. The image of a Thanksgiving tablescape, complete with a Horn of Plenty, fruits and wine, will have the person on the receiving end of this lovely Thanksgiving card feeling as if they're already sitting down ready to enjoy a feast surrounded by all the people they care about. But most importantly, they'll feel special knowing you took the time to wish them a wonderful holiday celebration. A Thanksgiving cornucopia card is the perfect way to wish an abundant and happy Thanksgiving to friends and family this year. 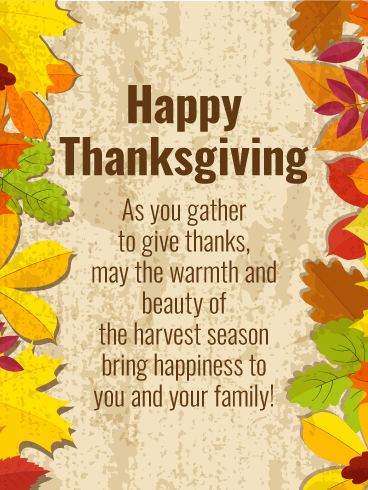 Send this beautiful Thanksgiving greeting card and give the best of the harvest! Give thanks and spread love when you send this colorful Thanksgiving card. We remember to share blessings and spread warmth to all around us during this season of gratitude. Thanksgiving is certainly a time to be thankful, so why not wish a few people a Happy Thanksgiving with a card that says it all! 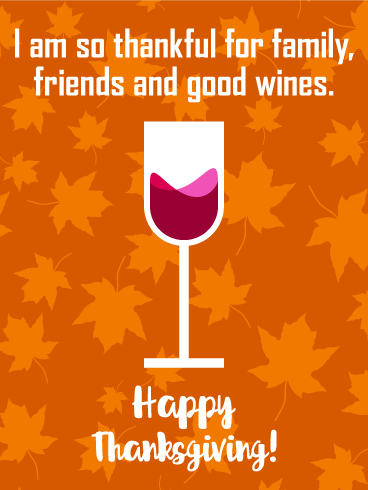 Let them know you are thankful for family, friends, and of course, good wines! 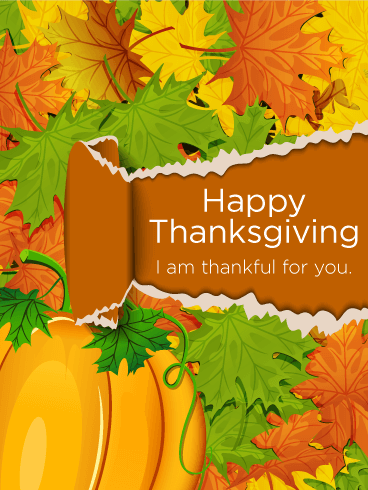 This Thanksgiving card features a traditional orange background with falling leaves creatively placed on the page. The white Happy Thanksgiving lettering displays perfectly against the orange, making the meaningful words stand out, and the burgundy color wine takes center stage! Many think of Thanksgiving as the unofficial start of the holiday season. It's a time to gather with family and friends, while counting our blessings and celebrating, complete with a delicious feast! Make those joyful feelings last with this colorful Thanksgiving card for someone who brings light into your life. Colorful autumn leaves and a traditional pumpkin create a warm, rich background for this heartfelt Thanksgiving card. The words may be simple, but the sentiment is one they'll always remember. No matter who it is, and no matter how far you may be from them this year, it's a wonderful way to show how grateful you are to have them in your life. Delightfully delicious! It's Thanksgiving, which means-it's time to feast! 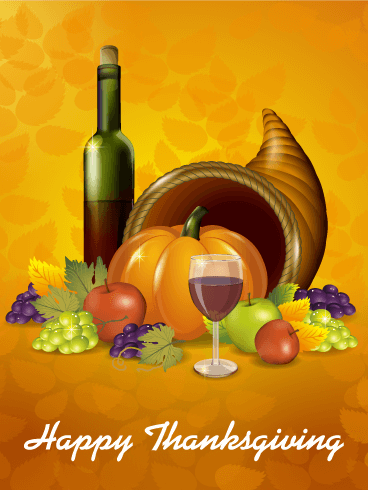 Send this warm and cheerful Thanksgiving card to wish friends and family a delicious Thanksgiving. Bring on the turkey and pumpkin pie! This is the season of good friends and good food. Give thanks to those around you when you send them this gorgeous Thanksgiving greeting card. 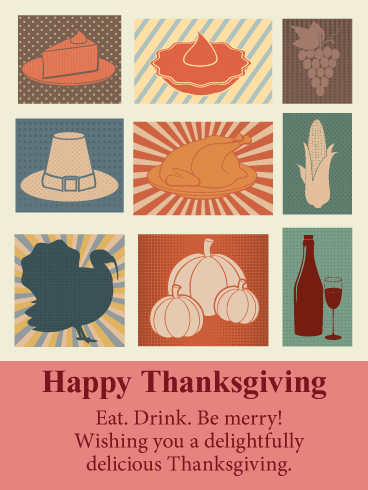 This turkey day card celebrates the season with all our favorite Thanksgiving treats. 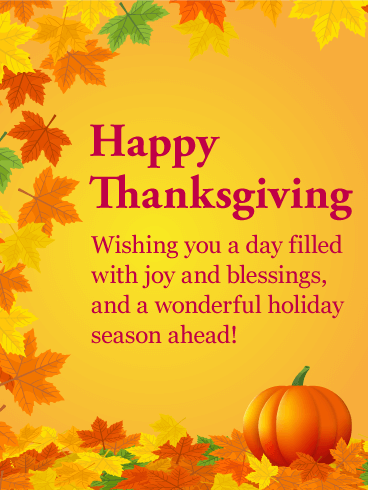 This is the season of thankfulness, a time to count one's blessings, and share love with those around us. 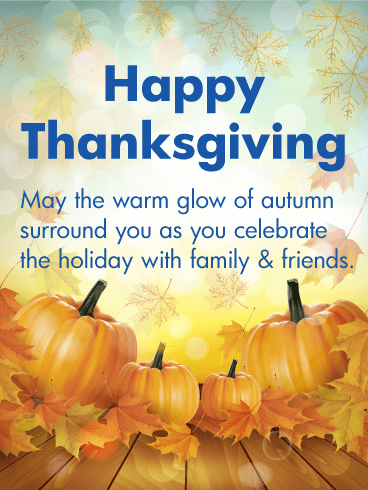 Spread joy in abundance when you send this vibrant Thanksgiving card with a friend or loved one. Celebrate the moments that matter most. 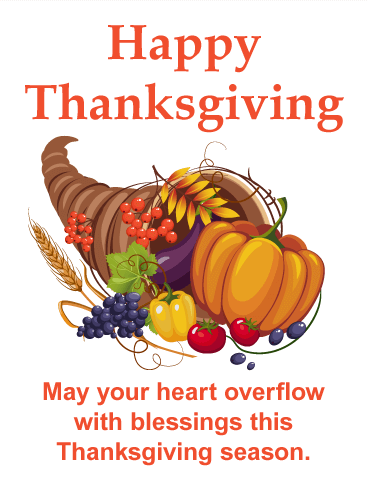 Reach out and bless someone with this colorful Thanksgiving cornucopia greeting card. The cornucopia symbolizes the blessings of the harvest, and our abundant good fortune to share such fine food with fine friends. As the weather grows cooler this time of year, the sentiments among the people we care about only grow warmer. This beautiful Thanksgiving card perfectly captures that feeling, with its glowing background, adorned with rich orange pumpkins and leaves, and of course with its message: a wish for the beauty of the season to surround someone special as they celebrate with family and friends. 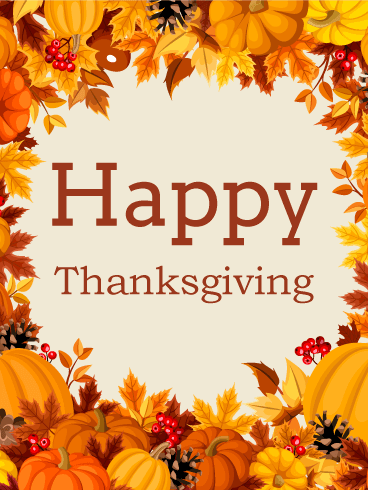 Thanksgiving is a time to gather and give thanks for the many blessings we have. It's also a time to wish family, friends and all the special people in our lives love and happiness. Decorated with autumn leaves in rich autumn colors, this lovely Thanksgiving card carries with it a heartfelt sentiment for the ones you care about as they celebrate during the harvest season.